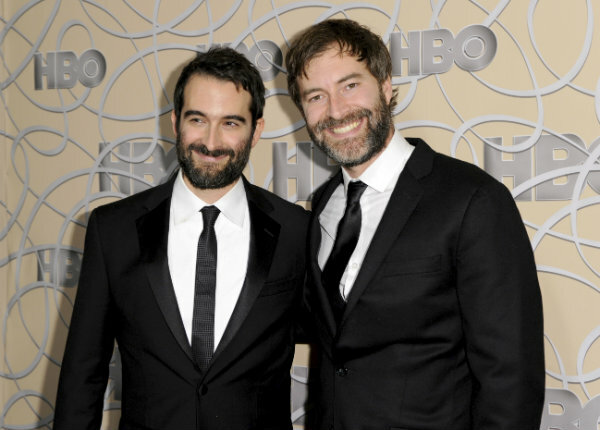 Jay and Mark Duplass made room for "Dumb and Dumber," ''Tootsie" and "Raising Arizona." But "The Godfather," often topping lists of all-time great films, was left off. Why it was says a lot about these off-beat indie darlings, who rose to fame in 2005 with their $10,000 film, "The Puffy Chair," and then went on create a mini-empire, with deals at Netflix and HBO. They've always led with their gut. "Jay and I don't approach things in any way intellectually whenever we're making something because when we do, it tends to be bad," says Mark Duplass. "We just let whatever comes out of our stomach be the thing." So their films weren't the typical best-of candidates like "The Godfather" or "Citizen Kane," but quirky ones like "Joe Versus the Volcano" and "The Horse Boy." Like their projects, it was a highly personal decision. "I think the more that you acknowledge that and get out of your head about what you think you like or should like, that's where the joy comes," says Jay Duplass, the older by four years. Their final top-10 film list is included in the siblings' deeply personal memoir, "Like Brothers," which mixes autobiography, moviemaking advice, observational comedy, old scripts and emails and tips on keeping friendships healthy while also being business partners. They advise budding filmmakers to start making 5-minute shorts on their iPhones, buy cheap cars with good warranties, save money by living with roommates, enter festivals, ask peers to be critics, pay it forward and urge artists to just keep plunging forward in a chapter titled "The Cavalry Isn't Coming." "The book is a simple product of survivor's guilt," says Mark Duplass. His brother agrees: "We do want to help people avoid a decade of suffering, if at all possible, because it was hard." The Duplass brothers fell into moviemaking when their father brought home a clunky video camera in 1984. Unsure how to use it, he gave it to his boys, then 8 and 12. One key detail was that it was so big, it needed a second person to carry the tape deck. A brotherly union was born. They've written, directed and produced films and TV shows together, including the HBO anthology series "Room 104" and the films "Jeff, Who Lives at Home" and "Cyrus." They've also acted (Jay in HBO's "Transparent" and Mark in "The League") and were behind and in front of the camera for the HBO series "Togetherness." Along the way, they became accidental icons, inspiration for people who like small, deeply felt projects over soulless big Hollywood fare. "We are B-minuses that made it. And that's really no false modesty," says Mark. Amid the book's film advice and life lessons — as well as defense of dicey pop culture items such as "Karate Kid Part II" and Air Supply — are practical lessons for keeping creative friendships alive. "I guess we kind of accidentally discovered that fighting and yelling at each other isn't necessary because when you fail as long as Jay and I did as artists, your ego is beaten out of you," says Mark. Their advice, which is just as applicable to marriages, includes listening without interruption to the other's side, agreeing not to argue after bedtime and, if all else fails, doing "the Porky Pig," in which both sides take off their pants like the cartoon character and try to reassess the debate with a straight face. "You just make it work. You do whatever it takes to make it work," says Jay. "We're never getting divorced. This is never going to end. Even if we don't work together, we're still in the same family. We're tied together forever." Lately, the brothers are taking a page from their own advice and helping other young filmmakers. They produced the Netflix documentary series "Wild Wild Country" for Maclain and Chapman Way — another filmmaking sibling team — and currently have backed the new docuseries "Evil Genius" on the streaming service. They admit they didn't know how to direct those projects but still wanted to help. "You know what we know how to do?" asks Mark. "Use our name, influence and money to fund, creatively protect and usher these filmmakers who are better documentary filmmakers than us and give them that thing and share it with them. It's the greatest thing."